... and the women who love them. I have to tell you, I am totally staging a coup on the local Borders as of next Tuesday morning. I cannot tell you how much I'm anticipating Carolyn Crane's debut novel. 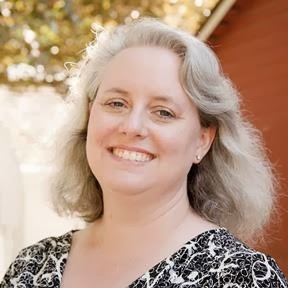 When I started up Alpha Heroes, Carolyn was one of the first bloggers to really make me feel like someone was out there paying attention to this little blog *sniff* -- I feel like we're friends even though we've never met. More importantly though, I love her writing. I find The Thrillionth Page so entertaining -- insightful, thoughtful, hilarious. I particularly like when she has those psychotic breaks guest posts by Little CJ and Miss Doreen. I just enjoy the way her mind works, which I think bodes very well for my chances of loving her fiction too. So natch, I'm happy to help spread the word about her big day. And since I must admit, I do like to eat, this sounded like an especially fun contest. 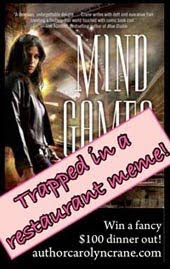 Okay, Carolyn made up this meme game to celebrate one of the many mysteries of Mind Games: Why does tortured mastermind Sterling Packard NEVER ever set foot outside the Mongolian Delites restaurant? Anybody anywhere can to play. First Prize: One randomly chosen player will get $100 toward a fancy dinner at a restaurant of their choice! (Any restaurant anywhere that accepts plastic or sells gift certificates. You don’t have to choose until you win.) Second prize: $50 toward a dinner. Just post the questions, your answers, meme icon and meme game line on social media site (blog, facebook, livejournal, other). 1. In MIND GAMES, hypochondriac heroine Justine Jones can’t figure out why tortured mastermind Sterling Packard never sets foot outside the Mongolian Delites restaurant. What if you were somehow trapped in a restaurant, what sort of restaurant would you prefer? Uppity Eye-talian. Mmmmm, pasta, fancy sauces, and rich desserts. 2. What if you won the fancy $100 dinner to a restaurant of your choice, and you could dine with any character from any book, movie, or history. Who would you choose? 3. Choose three characters to dine with for a lively dinner party (you can define lively however you want). Hmmm. Oliver Wendell Holmes, Lady Whistledown, and Sam Donovan (a/k/a Mr. Perfect) . Buncha wordy smart-alecks. Though... if it were the kind of dinner party where someone were to feel, you know, obligated to put out afterward, I might sub in pre-Jane V for Sam, even if his conversation skillz aren't quite up to Holmes' standard. Meme Game! Send meme game link by 4/8 to meme@authorcarolyncrane.com to enter. Anyone can play. Details at www.authorcarolyncrane.com. Hey, what a nice surprise! Thanks for playing my meme game! I love your wordy dinner party. (with V for dessert...hmmm, are you breaking the rules?) LOL. No, that's fine, and really, I feel you on it, sister. Are you freaking out? What are you doing Tuesday to celebrate?? DISCLAIMER: Some books reviewed here are provided by publishers or authors. I review these as honestly and fairly as those that I purchase. I do not accept any other compensation for reviews. More details and comments policy here. 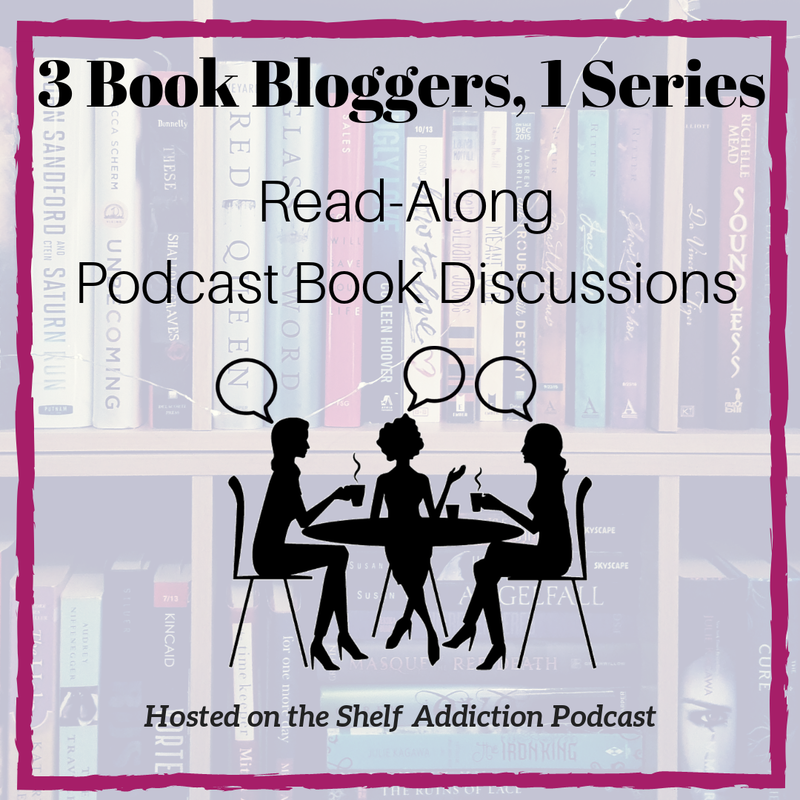 Reviews, opinions, and general blather about romance: the books, the authors, the trends, the cliches are all fair game.